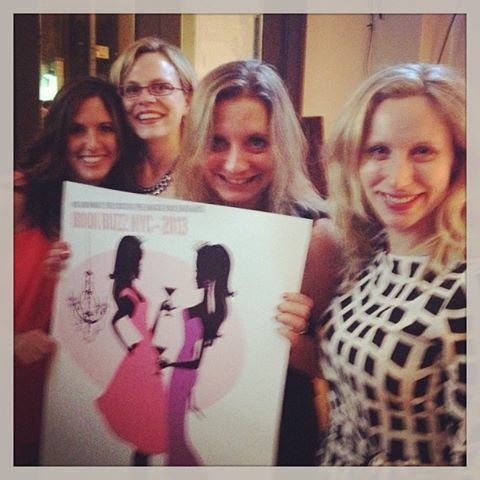 Book Buzz 2013 – oh what a night! I am exhausted! I am writing this during my lunch hour on Monday afternoon after a long, four-day weekend which, for once, actually felt long! It started last Wednesday evening, the night before Book Buzz 2013, the author mix and mingle I organized along with seven other authors in New York City. Pre-Buzzing – After work on Wednesday, I was at Starbucks, writing my 4th novel (it’s already 20 pages!) when I received an email from my friend and fellow author, Francine LaSala. She asked what I was up to as Jen Tucker, another friend and fellow author, had arrived from her hometown of Indiana and had checked into her hotel in NYC for Book Buzz and the Book Expo America Conference (BEA”) which had commenced that day at the Jacob Javits Center. They were going to get a drink and asked if I wanted to join. After years of tweeting, “Facebooking” and corresponding via email, I had met Francine face-to-face for the first time a few weeks earlier while we were planning Book Buzz. I had never met Jen although we, too, were already “virtual” friends. I headed over to Jen’s hotel both excited and a little nervous to meet in person. The second I got there, I already felt like I had known these women for years which I basically had. Francine made a joke about peeing in Jen’s hotel bathroom and jumping onto her bed within about five minutes of meeting her. I basically did the same thing because we were just that comfortable. We decided to go out for a drink and I felt like such a “local” as I led the others to the closest strip of bars. After entering and leaving one bar at once when it was just too loud, we found a sports bar more suitable for conversation and got a table in the back. We talked about everything – writing, reading, diet and exercise habits, sports, the upcoming event etc. and had lots of laughs over a drink, but Jen had been traveling, Francine had spent all afternoon at BEA and I had worked all day. We were tired and decided to call it an early night since Book Buzz was the following evening. Sam – I woke up on Thursday morning totally excited about the event but also completely stoked because author Samantha Stroh Bailey (“Sam”) would be arriving that morning from her hometown in Toronto and we had plans to meet up for brunch. Francine was awesome enough to pick Sam up from the airport and then they were going to drop by my apartment. I have been emailing Sam almost daily for almost a year and I couldn’t wait to actually meet her in person. Like Francine and Jen, Sam did not disappoint. She is as witty and down-to-Earth offline as she is online and within a few seconds, I once again forgot that we had just met. After heading over to Stone Creek Bar & Lounge where the event was being held to drop off our books and swag, Francine had to run to the conference but Sam had time to have lunch with me. It was so great to chat with her without a computer between us but, alas she had an appointment at the Kobo table at the conference and so I put her in a cab and headed back to my apartment to get ready for the party. I even got my hair blown out for the occasion! A place called Dry Bar that specializes solely in blow outs opened across the street from my apartment and I had been dying for an excuse to get my hair done there. I couldn’t think of a better occasion than Book Buzz 2013! Almost time – All dressed up, I waited for a cab to take me to Sam’s hotel for a pre-event drink. No cabs came. Correction, many cabs drove by, but they were either occupied or off duty. After ten minutes of waiting on the street corner worrying that I was going to sweat through my dress (it was HOT), I met a couple also waiting for a cab. When I told them I was headed to my author party, they offered to help me find a cab first. After another ten minutes of waiting in vain for a yellow cab, we finally hailed down a gypsy cab and the three of us decided to take it together. The couple would not accept my money and simply wished me congratulations on the party and to have a great time. If you two are reading this, THANK YOU. I finally made it to Sam’s hotel, got in the elevator and pressed the button for the Penthouse (Sam is fancy like that…), and nothing happened. Oops, no one told me I needed a key for the elevator! Take two, I finally made it up to Sam’s hotel room where we exchanged compliments “You look great!”, “No, YOU look great!”, “WE look great.” And we did. Time for the party. The Event – After walking to the event (still couldn’t find a cab), we finally made it to Stone Creek Bar & Lounge where we were greeted by authors Lucie Simone and Eileen Goudge. I had participated in several promotions with Lucie and read her books and was very excited to meet her. And Eileen Goudge, well, who wouldn’t be excited to meet a New York Times best-selling author, especially one as kind and open as Eileen? They were both beautiful and charming and I am happy to report that while I did not get to spend too much time with them during the event, we got to know each other better later in the weekend. Cari Kamm arrived next, looking absolutely stunning. I had met her once before when we were planning the event and since she’s local, I hope to hang out with her again. Anyone who attended Book Buzz can thank Cari for the Pink Stiletto cocktail as she was responsible for getting us the liquor sponsor from Shpilka Vodka. Jen Tucker had trouble getting a cab but made it shortly thereafter and then came Heather Thurmeier. I had an opportunity to chat with Heather later in the evening and after getting to know her better cannot wait to start reading her Bachelor-inspired novel, Falling for You, which is newly downloaded on my Kindle! Last but not least was blogger, Julie Valerie who worked her tail off during the event. While the rest of us mixed and mingled, Julie stood watch by our books and handled all of our sales. She also promoted the hell out of the event ahead of time. I was very excited to meet Julie. Not only does she crack me up with her tweets on a daily basis, but she is so supportive of the chick lit genre, writing book reviews and organizing blog hops, and I wanted to express my gratitude in person for everything she has done. 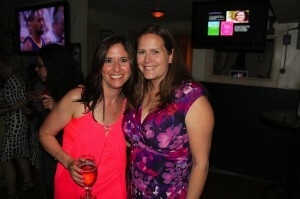 Now that everyone was in the house, it was time to party and we sure did! The turnout surpassed my expectations and I had so much fun mingling with readers, bloggers, other authors and industry people alike. I had several friends attend and I am so thankful for their support and hope they had a great time as well and maybe discovered a few more authors. Although I obviously hoped to sell books, I was more excited to simply connect with our guests. Everyone was so friendly and engaging and I thoroughly enjoyed my role as one of the co-hosts as I made my rounds through the bar. One of our co-sponsors, Diversion Books, was generous enough to buy several platters of appetizers but I was too busy chatting to eat anything. I must confess that I was nervous about meeting so many people and concerned that I would be shy but for several reasons, that did not happen. I can probably blame some of it on the Pink Stiletto cocktail that I drowned before the guests arrived. Also, I felt very pretty in my new dress and high heeled shoes, especially with my hair professionally blown out with loose curls! Additionally, it was just so easy to converse with our friendly and enthusiastic guests and my bubbly co-hosts. Finally, although I have two published novels and one in contract, that night I truly felt like a “real” author for the first time. Perhaps it was seeing paperback copies of my books on display and spying several people actually purchase them. Maybe it was the continuously running slide show that Francine’s husband created with photos of all eight authors, our book covers and blurbs from reviews. Whatever the reason, I felt like it was my night to shine and I wasn’t going to waste it feeling shy or bashful. I savored every moment. Before I knew it, people were saying their goodbyes, many of them with our books in their oversized handbags. After speaking to several guest authors, I also left with a list of books to download on Amazon. After the event officially ended, a few of the authors went home with promises to keep in touch and do it again the following year but several of us stuck around for a bit – partially because we were too tired to motivate to leave! With achy feet (and cuts on my toes from my new shoes), I collapsed on a couch in a corner of the bar, along with Sam, Francine, Jen and Julie and we exchanged stories about our evenings and continued getting to know each other. I can’t remember what we talked about anymore but I definitely remember laughing – a lot!! I was not, however, laughing as I walked home with swollen feet and a huge bag of books later but it was so worth it! This awesome woman bought all of our books! The best part – I got to see most of the authors the following night for dinner at Eileen Goudge’s apartment! And after that further unforgettable bonding experience, I got to have brunch with Sam and Lucie on Saturday morning and attend BEA with Sam that afternoon. (Thank you Francine for lending me your identity for the day!) 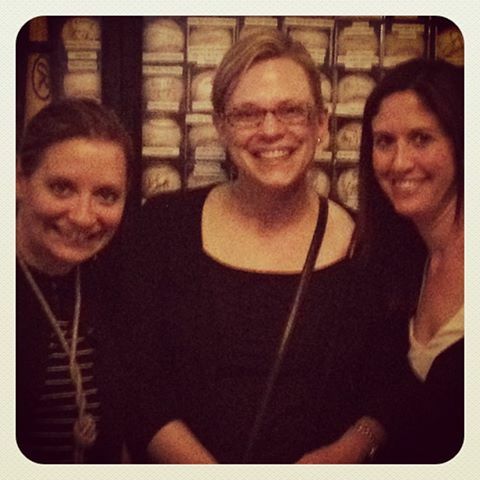 And finally, I had one last dinner with Sam and my friend Hilda on Saturday night. Over drinks at the bar, we became friendly with the bartender who promised to buy our books and even write reviews on Amazon – not bad for a night out! As tired and anxious as I was for my head to hit the pillow on Saturday night, it was bitter sweet because the weekend had truly come to an end. The weekend we had been planning tirelessly for months was really over. 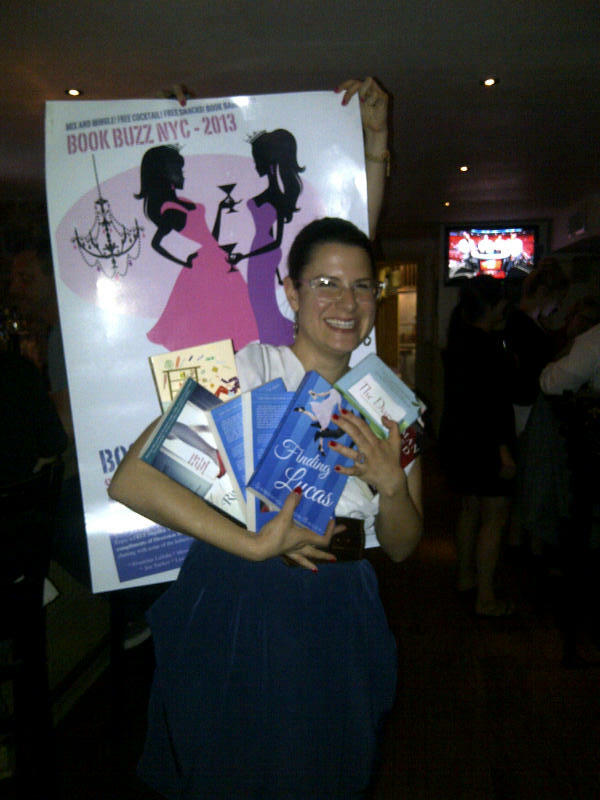 Then again, that was Book Buzz 2013. Now we can look forward to Book Buzz 2014! Who’s in? I am so excited to announce that along with seven other authors, I will be hosting the first annual BookBuzz event in New York City on Thursday, May 30th! If you are in the area, please come and mingle with us, have a complimentary “Pink Stiletto” cocktail and chow on some free appetizers. We’ll also be selling signed copies of our books at a discounted price. If you aren’t in the area and want to take a trip to NYC (and who wouldn’t want to do that), we’d love to have you! For full details, please see the attached link. I’ve posted the reasons I am so BUZZED to be a part of this event and I would love to meet all of you so come on by! 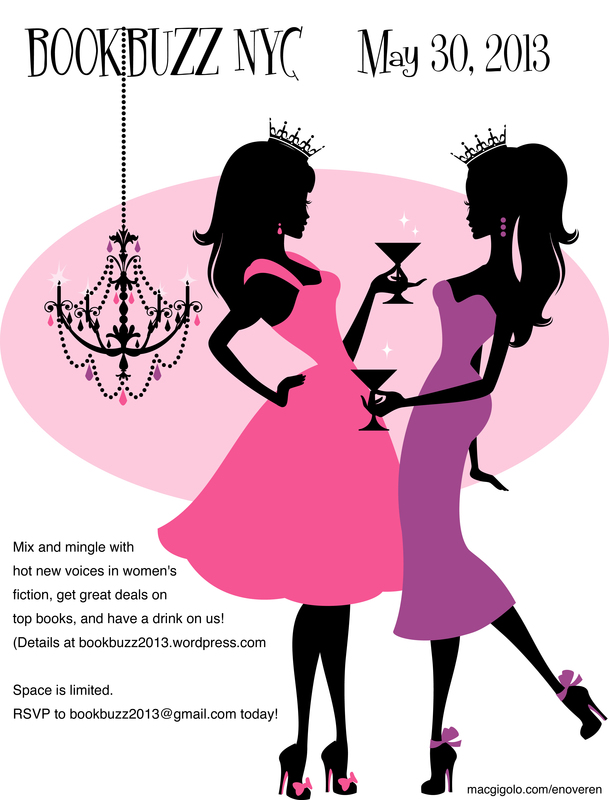 But don’t forget to email your rsvp to bookbuzz2013@gmail.com to ensure that your name is on the list and secure your free Pink Stiletto! 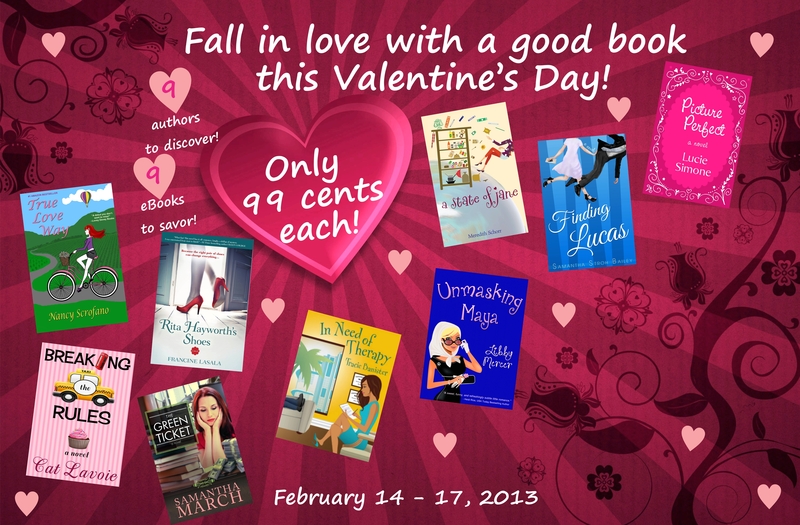 Valentine’s Day ebook sale – 9 authors, 9 ebooks, 99 cents each! Love is in the air . . . and it can be on your Kindle, too! Do you want to fall in love with a good book this Valentine’s Day weekend? How about 9? Then don’t miss this special promotion. For four days only (February 14th – February 17th), 9 popular Chick Lit authors will be lowering the prices on their favorite rom-coms to 99 cents on Amazon.com! At that price (A bottle of wine costs more! ), why not sample them all? Some delicious literary treats await you, and unlike chocolates these goodies are calorie-free! And guys: If your sweetie is a book-lover, you’ll make her Valentine’s Day by gifting her with one (or more) of our fun, romantic stories! 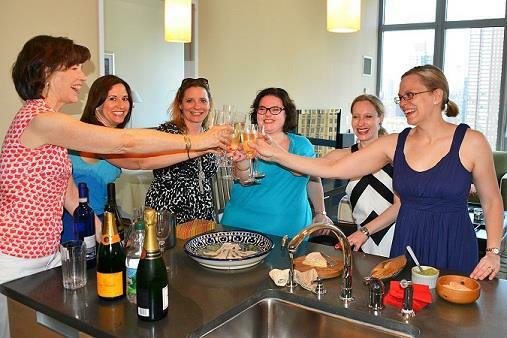 In the spirit of coming together for the holidays, eight popular Chick Lit authors are “partying it up” with a shared promotion for book lovers! That means eight fun and fizzy e-books, each priced at $3.99 or less, that are packed with plenty of laughs and romance to keep you entertained on those long winter nights! And if you’d like to gift one of these books to a Chick Lit fan, we’ve got you covered with your choice of paperbacks! Which books are featured in this festive promo? Finding Lucas by Samantha Stroh Bailey – Daytime talk show producer Jamie Ross is beyond fed up with her toxic bad boy turned metrosexual boyfriend. Spurred on by her gang of quirky friends, she goes on a hilarious, at-times disastrous, and totally life-changing hunt to track down the “one who got away.” But are some loves best left behind? In Need of Therapy by Tracie Banister – Handling the problems of hysterical hypochondriacs, lovelorn neurotics, and compulsive man whores is all in a day’s work for super-shrink Pilar Alvarez. But can she deal with her crazy Cuban family, a trio of unsuitable suitors, and a threat to her practice without ending up on the couch herself? E-book available on Amazon and Barnes & Noble; paperback available on Amazon. What the Dog Ate by Jackie Bouchard – Discovering what her dog ate turns Maggie Baxter’s world upside down. With her chocolate Lab, Kona, as her guide, can Maggie forego her overly analytical ways to find a new life filled with tail-wagging joy? E-book available on Amazon, Barnes & Noble, and iTunes; paperback available on Amazon and Barnes & Noble. The Girl, the Gold Tooth, & Everything by Francine LaSala – Suburban housewife Mina, beaten-down and struggling with amnesia, starts getting her memory and her mojo back. But she soon learns everything has a price in this fast-paced, richly layered, and darkly humorous satire! E-book and paperback available on Amazon and Barnes & Noble. Breaking the Rules by Cat Lavoie – When Roxy Rule shares a passionate kiss with her lifelong best friend, she must come to terms with her feelings for him while dealing with two sisters in full crisis mode, a boss who makes her want to stab herself with a letter opener and a fiancé who can’t wait to walk down the aisle. Can she keep it together–or will she break under the pressure? E-book available on Amazon, Kobo, and Barnes & Noble; paperback available on Amazon. Devastatingly handsome and deliciously weird, John Harrington is the man of Caitlyn Taylor’s dreams… and her nightmares. She has no use for a womanizer like him, and dodges his advances like a pro. But when they end up in Paris together, Caitlyn feels her resolve begin to slip. How will she ever be able to resist the irresistible in the most romantic city in the world? E-book available on Amazon, Barnes & Noble, and Kobo. A State of Jane by Meredith Schorr – Jane Frank is newly single after nine years and looking for a second chance at love. But when she dives head first into the NYC dating scene and finds it infested with flakes who are interested today and gone tomorrow, it may be time for Jane to turn the tables! Picture Perfect by Lucie Simone – Lauren Tate’s perfectly planned life quickly unravels at the seams when a smear campaign threatens her career as a top TV executive, but she learns just how cutthroat showbiz can truly be when the hottest scandal in Tinsel Town turns deadly and the Hollywood hunk who’s stolen her heart goes missing. E-book available on Amazon; paperback available on Amazon and Barnes & Noble. Stay tuned for blog posts from each of the above authors when we answer 8 Holiday Questions for 8 Authors. Finally, a world of thanks to the amazingly generous bloggers below who have agreed to help us spread the word about our books! We invite everyone to check out these fabulous blogs!